Henry Ford (July 30, 1863 – April 7, 1947) was an American industrialist, the founder of the Ford Motor Company, and sponsor of the development of the assembly line technique of mass production. Although Ford did not invent the automobile or the assembly line, he developed and manufactured the first automobile that many middle class Americans could afford. In doing so, Ford converted the automobile from an expensive curiosity into a practical conveyance that would profoundly impact the landscape of the twentieth century. 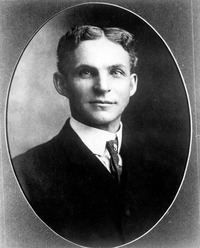 His introduction of the Model T automobile revolutionized transportation and American industry. As owner of the Ford Motor Company, he became one of the richest and best-known people in the world. He is credited with "Fordi Henry Ford (July 30, 1863 – April 7, 1947) was an American industrialist, the founder of the Ford Motor Company, and sponsor of the development of the assembly line technique of mass production. Although Ford did not invent the automobile or the assembly line, he developed and manufactured the first automobile that many middle class Americans could afford. In doing so, Ford converted the automobile from an expensive curiosity into a practical conveyance that would profoundly impact the landscape of the twentieth century. His introduction of the Model T automobile revolutionized transportation and American industry. As owner of the Ford Motor Company, he became one of the richest and best-known people in the world. He is credited with "Fordism": mass production of inexpensive goods coupled with high wages for workers. Ford had a global vision, with consumerism as the key to peace. His intense commitment to systematically lowering costs resulted in many technical and business innovations, including a franchise system that put dealerships throughout most of North America and in major cities on six continents. Ford left most of his vast wealth to the Ford Foundation and arranged for his family to control the company permanently. Ford was also widely known for his pacifism during the first years of World War I, and also for being the publisher of anti semitic texts such as the book The International Jew. His father gave him a pocket watch in his early teens. At 15, Ford dismantled and reassembled the timepieces of friends and neighbors dozens of times, gaining the reputation of a watch repairman. In Aldous Huxley's Brave New World (1932), society is organized on "Fordist" lines, the years are dated A.F. or Anno Ford ("In the Year of our Ford"), and the expression "My Ford" is used instead of "My Lord". Ford, his family, and his company were the subjects of a 1986 biography by Robert Lacey entitled Ford: The Men and the Machine. The book was adapted in 1987 into a film starring Cliff Robertson and Michael Ironside. In the 2005 alternative history novel The Plot Against America, Philip Roth features Ford as Secretary of Interior in a fictional Charles Lindbergh presidential administration.